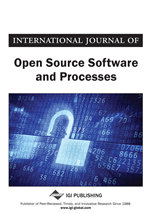 A discrepancy exists between the emphasis posed by practitioners on decentralized and non-hierarchical communication in Free Libre/Open Source Software (FLOSS) communities and empirical evidence of their hierarchical structure. To explain this paradox, it is hypothesized firstly that in FLOSS communities local sub-groups exist and are less hierarchical, more decentralized than the whole social network. Secondly, it is hypothesized that the bulk of communication exchanges taking place in the community happens inside local sub-groups formed by the most active community members. The recollection that practitioners have of FLOSS communities to which they participate would then be influenced by the position that they occupy inside those sub-groups. A measure of structural cohesion based on network node connectivity is proposed as an effective method to test whether FLOSS communication networks can be decomposed in nested hierarchies of progressively less centralized sub-groups. The recently introduced measure of weighted rich-club effect is adopted to test for the tendency of the most active community members to control communication by interacting more intensely with each other than with other members of the network. Results from a case study that are consistent with the hypotheses are presented and discussed. Although practitioners and advocates emphasised decentralized and non-hierarchical communication as one essential component of FLOSS success Raymond, 98; Cox, 1998), a growing body of empirical evidence supports the claim that FLOSS communities manifest forms of internal hierarchy (Crowston & Howison, 2006; Bird, Gourley, Devambu, Swaminathan, & Hsu, 2007; Jensen & Scacchi, 2007; Long & Siau, 2007). How can this discrepancy be explained? This is the question from which the present study stems. It has been long known in the organizational literature (See Salancik & Pfeffer, 1978; Ibarra & Andrews, 1993 for a comprehensive review) that direct social relationships and social network structure surrounding individuals in an organization influence their perceptions. Therefore, the first hypothesis here advanced is that in the social networks constituting FLOSS communities local sub-groups exist in which communication is denser among individuals and that, because of such high density, are less hierarchical than the whole social network to which they belong. This hypothesis is motivated by the fact that if these sub-groups were found, developers inside these sub-groups, and possibility among them highly active members of FLOSS communities like practitioners and advocates who write about the FLOSS phenomenon, would perceive their community as less hierarchical than what overall measures of hierarchy would report because they would be influenced by the insider position they occupy. Furthermore, on top of the local configurations assumed by the communication structure, concentration of the total volume of communication among a sub-group of highly active community members could reinforce the perception of decentralization and non-hierarchization by such a sub-group of developers. Therefore, a second hypothesis is here advanced is that the most active members tend to concentrate the total volume of communication circulating in a FLOSS community. If confirmed, the two hypotheses would demonstrate the existence of areas in the social networks of FLOSS communities inside which, because of the influence exerted by local characteristics, the perception of the overall community structure is likely to by non-hierarchical and despite the actual overall hierarchization of the community. The structure of the study is as follows. Firstly a measure of structural cohesion based on network node connectivity (Moody & White, 2003) is presented as a method to test for the existence of a hierarchy of progressively more decentralized sub-groups within FLOSS communities. The measure is discussed with reference to the existing literature on hierarchy in FLOSS projects. Secondly, the recently introduced measure of weighted rich-club effect (﻿Opsahl, Colizza, Panzarasa, & Ramasco, 2008) is presented as a method to test for the tendency of the most active community members to interact more intensely among themselves. Thirdly, results from a case study on a FLOSS community are presented and discussed. In accordance with the first hypothesis an articulated hierarchical structure of sub-groups progressively more cohesive, and consequently less centralized, is found and analyzed with a specific focus on the configurations assumed over time by its cohesive core. The weighted rich-club measure is then computed and consistently with the second hypothesis a tendency of progressively smaller sub-groups of the most active community members to communicate disproportionately more among themselves is found. Finally, potential applications to the study of the FLOSS organizational phenomenon for the proposed measures of sub-group hierarchy and communication control are discussed together with the limitations induced by the preliminary nature of the empirical tests here presented.